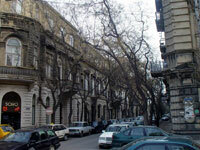 Baku is an ancient coastal city on the Caspian Sea. Dating back to the 1st century AD, its long and colourful history includes occupation by the Persians and Russians. The discovery of oil in the 19th century made Baku a hotly contested region during World War II and for much of the 20th century. In recent years, the city has embarked on a massive restructuring initiative, with ugly Soviet-style buildings torn down for parks and gardens. Indeed, improvements to services and infrastructure have been substantial, and Baku is coming into its own as a modern, 21st century city. That said, Baku has retained its sense of culture and history through preserving its Old City: a walled fortress designated a UNESCO World Heritage Site. Visitors can easily explore the walkable maze of narrow cobbled streets in a single day, seeing stunning medieval structures like the Maiden Tower, the Shirvanshahs' Palace, as well as the public baths and dozens of mosques. Outside the Old City, glass-shelled towers dominate the skyline and air-conditioned shopping malls replace markets and street-side shops. Many excellent museums, a lively nightlife and a renowned restaurant scene also await visitors. Travellers who want to enjoy the sparkling Caspian Sea may be disappointed by the city's beaches. However, the Absheron Peninsula's north coast offers several beautiful stretches of sandy coastline and excellent facilities, most notably at Bilgah and Amburan.